Bring It Food Hub's Deep Spring Subscription starts March 19 and runs till May 3! Sign up now for either a monthly subscription or season long subscription! Vegetable subscription size options are available in two varieties: Classic subscription ($20 weekly) which is ideal for two people wanting to add fresh local produce to their weekly diet. Deluxe subscriptions ($35 weekly) are ideal for a family of four. Subscribers to the spring distributions can expect to receive weekly allotments of the region’s most delicious spring crops such as radishes, kale, spinach, squash, okra, tomatoes, eggplant, mixed variety of lettuces, mustard greens, turnips, and more! 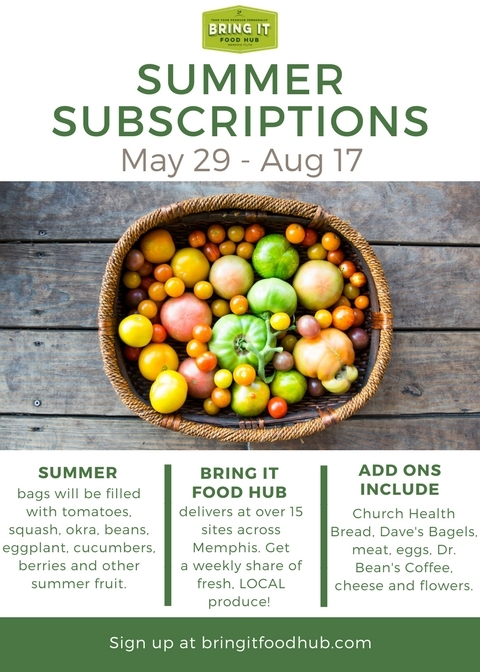 In addition to vegetable subscriptions, subscribers can purchase weekly add-ons for delivery with their vegetable share such as Tamboli pasta, Dr. Bean's Coffee, Dave's Bagels, Marmilu Farms Meat and Butcher Block, Kenny's Farmhouse cheese, local eggs, and Whitton Farms flowers! We deliver to over 15 sites across Memphis, connecting you to your local farmers. We work with farmers within a 150 mile radius of Memphis, meaning that we offer the freshest local produce to our subscribers. As a part of our mission, we believe in strengthening farmers' livelihoods by freeing up farmers to do what they do best - farming. We are looking for vendors to participate in a farmers market and plant sale at the St. Jude Garden on April 19th. We are seeking produce, prepared food, plant, and art vendors. If you are an interested vendor, email mary@memphistilth.org for more info. Mark your calendar for Saturday, May 4th, and join us for “May Day," featuring Tour de Coop and Bristerfest, hosted by Memphis Made Brewing Co. May Day will be a community field day of bikes, birds, bees, bands, and brews. May Day will start at Memphis Made Brewing Co. with the fourth annual Tour de Coup, a unique bicycle tour visiting community gardens, backyard chicken coops and beehives throughout the city. This tour not only offers participants examples of how they can make their own neighborhood self-sufficient, but also connects different areas of Memphis in new ways. As participants arrive back at Memphis Made Brewing Co, the seventh annual Bristerfest will begin where attendees will enjoy live music from local and regional bands, art from local artist students and professionals, and a bazaar of vendors with crafts and gift items. This event is free and open to the public. However, a $15 registration fee per person for Tour de Coop or Bristerfest will include an EXCLUSIVE 2019 May Day t-shirt (limited supply). 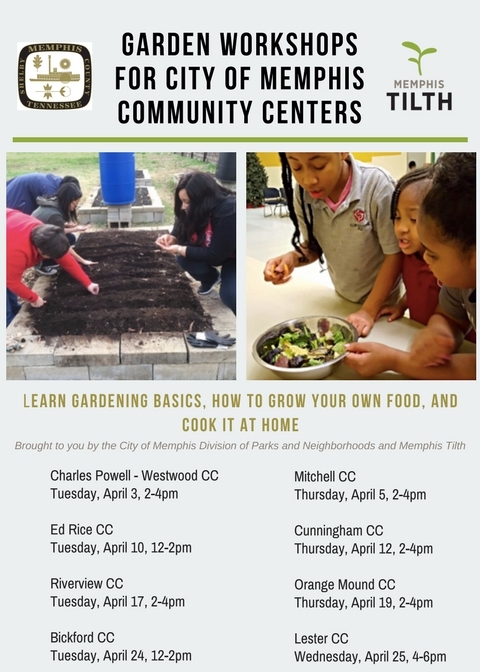 A suggested pay what you can registration fee of $10.00 per person to benefit the work of Memphis Tilth is greatly appreciated! Registration will be available April 1st - May 3rd. We have vendor booths available. If you are interested in having a vendor booth, please contact Ainsley Stephens at ainsley@memphistilth.org. If you would like to sponsor this event, please review our sponsorship packet. Join us Saturday, March 16th, at the Eat This Book Festival at the Benjamin L Hooks Library from 11AM - 2PM. This is the Memphis Public Libraries first ever festival to celebrate Memphis Food Culture! Then head over to Wiseacre Brewing Co for the Midtown Eats Kick Off Party from 3 - 6 PM to celebrate the kick off of the amazing community based project that we were so honored to be a part of in partnership with Rhodes College! Enjoy a brew and learn more about the project and our organization! We hope to see you there! From March 1 - March 31, we are fundraising to support our Grow Local program! Help us reach our goal of $500! Go to https://www.farmraiser.com/campaigns/2019-high-mowing-seed-fundraiser/dashboard?fbclid=IwAR0I-TpKeJYeT5YpZvYbud67nZPHiGOeEsmHg4naai6pTU26hJ-YRB9YJII and choose from over 50 different seeds to purchase, and half of the proceeds will go to Memphis Tilth for our fundraiser. The seeds you order will be ready to pick up by mid April at our office, 575 Suzette St - Suite C, Memphis, TN 38126. We also have an option to start the seeds you order for an additional $25 cost! By purchasing this service, we will start your seeds for you when we receive the seeds by mid April. Once we receive the seeds, we will email you the timeframe of when the seeds will be ready to pick up. If you would like for us to start your seeds, go to https://www.memphistilth.org/store/start-seeds. Thursdays, February 7, 21, and 28. For the LOVE of Gardening. Join us in February to learn how YOU can Grow Local! 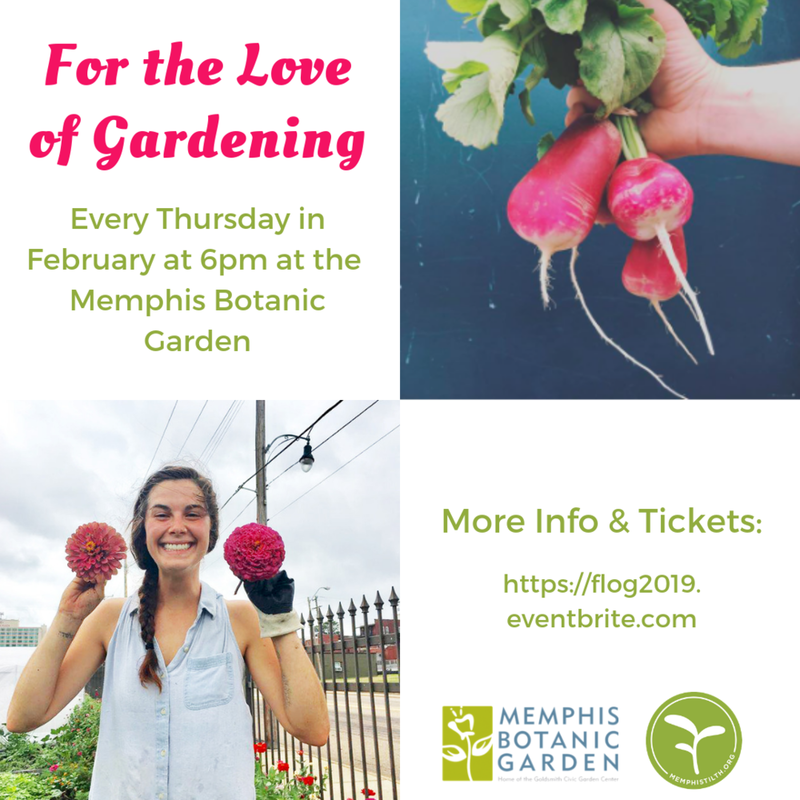 Memphis Tilth is partnering with Memphis Botanic Garden to host a 3-part garden themed workshop series with each week focusing on a new topic led by local gardeners from our communities and neighborhoods. Classes begin at 6pm. Please join us for the 2019 Mid-South Farm to Table Conference on February 11, 2019, at Christian Brothers University in Memphis, TN. This year’s conference, presented by Memphis Tilth and a community-led planning committee, will bring together local and regional farmers, food justice advocates, educators, non-profit leaders, and consumers. We invite you to add your voice and to share your ideas for building a better local food system through your attendance and sponsorship of this conference. At this year’s conference, Ellen Polishuk, a nationally-renowned consultant on sustainable small farm business operations and the co-author of the newly published Start Your Farm: The Authoritative Guide to Becoming a Sustainable 21st Century Farmer, will present a keynote address on the current state of sustainable agriculture. There will also be sessions on farm-life balance, gardening with children, food justice research and practice, and community-based agriculture. Join Memphis Tilth for the third and final installment of our fall film series, hosted by St. Jude Children's Research Hospital at the Marlo Thomas Center for Global Education and Collaboration. Through this series we will showcase films highlighting some of the most critical issues affecting our food and farming systems, and share ways in which the work we do and the values we hold at Memphis Tilth support positive change. The third film in our series is Dolores. Dolores Huerta is among the most important, yet least known, activists in American history. An equal partner in co-founding the first farm workers unions with Cesar Chavez, her enormous contributions have gone largely unrecognized. Dolores tirelessly led the fight for racial and labor justice alongside Chavez, becoming one of the most defiant feminists of the twentieth century—and she continues the fight to this day, at 87. With intimate and unprecedented access to this intensely private mother to eleven, the film reveals the raw, personal stakes involved in committing one’s life to social change. Prior to the film, Valentina Henao will introduce her work and speak on some of the themes covered in the film. Valentina was born in Cali, Colombia. Due to the remarkable armed conflict in Colombia in the 1990’s, a combination of economic, political and social factors in the country, Valentina’s family decided to move to the U.S. in search of a brighter and safer future. In the years since, Valentina has emerged as a leader within the Hispanic community, founding La Voz de la Comunidad (The Voice of the Community) to help community members stay informed on issues related to safety, progress, and education. In addition to her volunteer work, Valentina currently works as a bilingual legal advocate with CasaLuz, an organization dedicated to preventing and reducing domestic violence and related crimes in the Spanish-speaking community and to promoting equal access to justice and other services. Refreshments sourced from local farms and producers will be served, and following the film Valentina will lead a discussion and Q&A with the audience. Before the film from 5:00 - 6:30 PM, Memphis Tilth will host a dinner in honor of the guest speaker at Caritas Village, featuring a menu of authentic Mexican cuisine. To learn more and to purchase tickets, visit here. Join Memphis Tilth staff, board, and St. Jude sustainability team before dinner for the screening of Dolores with guest speaker Valentina Henao. Valentina Henao, founder of La Voz de la Comunidad (The Voice of the Community) and an advocate for safety, progress, and access to education and other services for members of the Hispanic community, will be joining to discuss her work and the themes of the film. Details and registration for the screening can be found here. The dinner will take place on the evening of Thursday, December 6th from 5:00 - 6:30 pm at Caritas Village. Dinner will be prepared by Eny's Tamales, who is a chef from Mexico. Your dinner experience will include a delicious authentic Mexican meal, including black bean, jalapeno and cheese tamales, poblano and chicken mole with tortillas and rice, guacomole, and salsa and chips. Chef Mac Edwards from Caritas Village will also prepare salad and dessert. Tickets are available for purchase at $35 per person or $60 for couples. This event is sponsored by the 2019 Mid-South Farm to Table Conference, which takes place on February 11, 2019, at Christan Brothers Univeristy. To learn more and to register, visit here. Memphis Tilth is participating in GivingTuesday, a global day of giving, on November 27. When you give to Memphis Tilth, you help support an economically sustainable, socially equitable, and environmentally sound local food system. Below are the various ways you can give to Memphis Tilth on GivingTuesday. All donations to Memphis Tilth are tax deductible. 2.Retweet @Benevity’s video using #BeTheGood (hint: it’ll be pinned to your profile). Make sure you @MemphisTilth mention us, and they’ll donate $10 on your behalf! Click the link here to retweet. 4. Memphis Tilth is now a member of the Kroger Community Rewards Program! This means that if you have a registered Kroger rewards card account, you can link it to Memphis Tilth, and a percentage of the purchase you make with your rewards card goes to Memphis Tilth! To link your card to Memphis Tilth, visit https://www.kroger.com/account/enrollCommunityRewardsNow/.Once logged into your Kroger account, you can search for Memphis Tilth either by name or by our code VK448, and then click Enroll. 5. Amazon Smile: If you make a purchase on Amazon, choose Memphis Tilth as your selected charity so that our organization can receive 0.5% of the purchase. Go to http://smile.amazon.com/ and search "Memphis Tilth". Amazon Smile contributions to Memphis Tilth are valid at any time during the calendar year. 6. Join us for dinner before the screening of Dolores with guest speaker Valentina Henao on December 6th. The dinner starts at 5:00pm at Caritas Village with a menu including authentic Mexican cuisine, prepared by Eny's Tamales. Tickets are $35 per person or $60 for a couple. Then join us for the screening of Dolores with guest speaker Valentina Henao, hosted by St. Jude Children's Research Hospital. This event is free and open to the public, but registration is required https://www.eventbrite.com/e/dolores-film-screening-presented-by-memphis-tilth-tickets-52619650792?aff=ebdssbdestsearch. 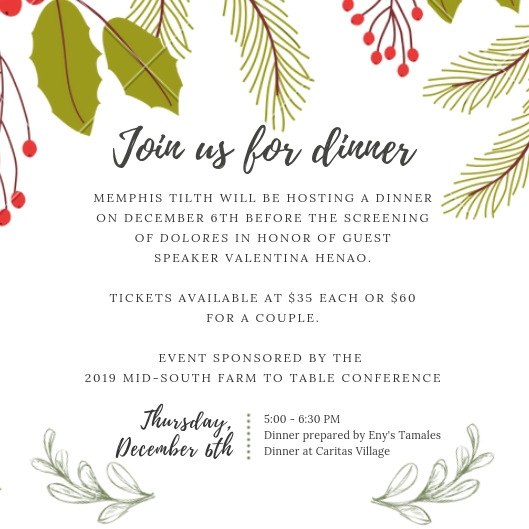 To learn more and to purchase your dinner tickets, visit https://www.eventbrite.com/e/memphis-tilth-dinner-for-the-screening-of-dolores-tickets-52633658690?aff=ebdssbdestsearch. 7. Planning on giving your family and friends gift cards this holiday season? If you purchase your gift cards at ShopwithScrip, a percentage of each gift card goes directly to Memphis Tilth! Shop the gift guide at ShopWithScrip.com/GiftGuide, and use enrollment code CC812BF362364 at checkout. 9. Donate your change! When you create an account on the Round Up app, the change from your linked credit card transactions will automatically be donated to the organization of your choice. For more information, click https://app.roundupapp.com/#/Register/7d040abe-2d1d-4acb-8f7a-0cfaee6421e6. 10. Eat at Chipotle Mexican Grill: If you eat at Chipotle for the whole month of November between 4-8pm, a third of all sales will go to Memphis Tilth. Only valid at the Chipotle on 2046 Union Ave Suite 101, Memphis, TN 38104. Tell the cashier at checkout about the fundraiser for Memphis Tilth, and a third of the sale will go to Memphis Tilth. Thank you all for your great support this year! Join Memphis Tilth for a farm walk at Lockard's Produce! Through this farm walk, we hope to connect you directly to your food and to your local farmer, gaining a better understanding of where your food comes from. At this farm walk, we will take a tour of Lockard's Produce farm and glean some of the produce along the way! All produce that we glean will go to food insecure members of our community, supporting our mission of food recovery and making healthy local produce more accessible in our community. Lockard's Produce is a Certified Naturally Grown farm in Ripley, TN. Their mission and vision is to re-establish their family’s legacy of naturally grown, fresh and healthy produce. The Lockards' parents and grandparents were farmers during the depression era in Ripley, and they stressed the importance of growing crops so that their families could have food to eat in that time of scarcity. Tickets are $10 per person. All proceeds go towards supporting farmer livelihoods through the mission of Bring It Food Hub. To learn more and purchase your tickets, click here. *This event is free for our Bring It Food Hub fall subscribers. Please contact ainsley@memphistilth.org for a registration code at checkout. If you have questions, contact Ainsley Stephens at ainsley@memphistilth.org or 901.443.7623. Join Memphis Tilth staff, board, and St. Jude sustainability team for dinner for the screening of The Arc of Justice with guest speaker Jillian Hishaw in our fall film series. This dinner will take place on the evening of November 8th from 5:00 - 6:30 pm at Memphis Tilth Headquarters. Dinner will be prepared by Chef Dru, a formally educated culinary professional of nearly 20 years. Currently, he teaches cooking classes at Sur la Table as well as provides private consulting and catering. Your dinner experience will include a multi course locally sourced and seasonal meal, including a butter bean hummus, peas and greens, roast squash with pan roast pork chops, and brown butter sage pumpkin pie, accompanied with a selection of wine. Tickets are available for purchase at $35 per person or $60 for couples. To learn more and to purchase your tickets, click HERE. We are having an Open House for our AOVS Urban Farm to celebrate the growth and success of the farm this season! There will be farm tours, food trucks, raffle items, and lawn games. Come see us and Alpha Omega Veterans Services Inc. to learn more about our organizations, our partnership, and the amazing work at the farm! Join Memphis Tilth for the first installment of our fall film series, hosted by St. Jude Children's Research Hospital at the Marlo Thomas Center for Global Education and Collaboration. Through this series we will showcase films highlighting some of the most critical issues affecting our food and farming systems, and share ways in which the work we do and the values we hold at Memphis Tilth support positive change. The first film in our series is Sustainable, a vital investigation of the economic and environmental instability of America’s food system, from the agricultural issues we face — soil loss, water depletion, climate change, pesticide use — to the community of leaders who are determined to fix it. Sustainable is a film about the land, the people who work it and what must be done to sustain it for future generations. Refreshments sourced from local farms and producers will be served. After the film, members of the Memphis Tilth team and St. Jude's Sustainability Manager will be available to discuss local initiatives and answer questions. 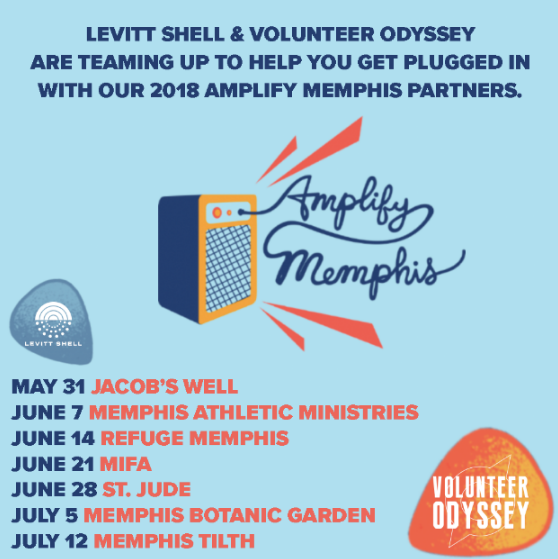 Levitt Shell and Volunteer Odyssey are partnering to promote nonprofit organizations doing great work in the community through Amplify Memphis. On July 12, Memphis Tilth will be the featured non-profit at the Levitt Shell. Come see us and listen to JD McPherson, starting at 7:30PM. For the entire month of June, Memphis Tilth will be featured as the all positive change jar donation at both Muddy's locations. All donations go to Memphis Tilth to support our mission! For more information about how it works, click here. MOTHER'S DAY IS ALMOST HERE, AND BRING IT FOOD HUB IS OFFERING GORGEOUS, LOCAL MIXED FLOWER BOUQUETS FOR $20! SEND MOM A BEAUTIFUL FLOWER ARRANGEMENT FROM THE AMAZING FARMER-FLORISTS OF DELTA SOL AND WHITTON FARMS. 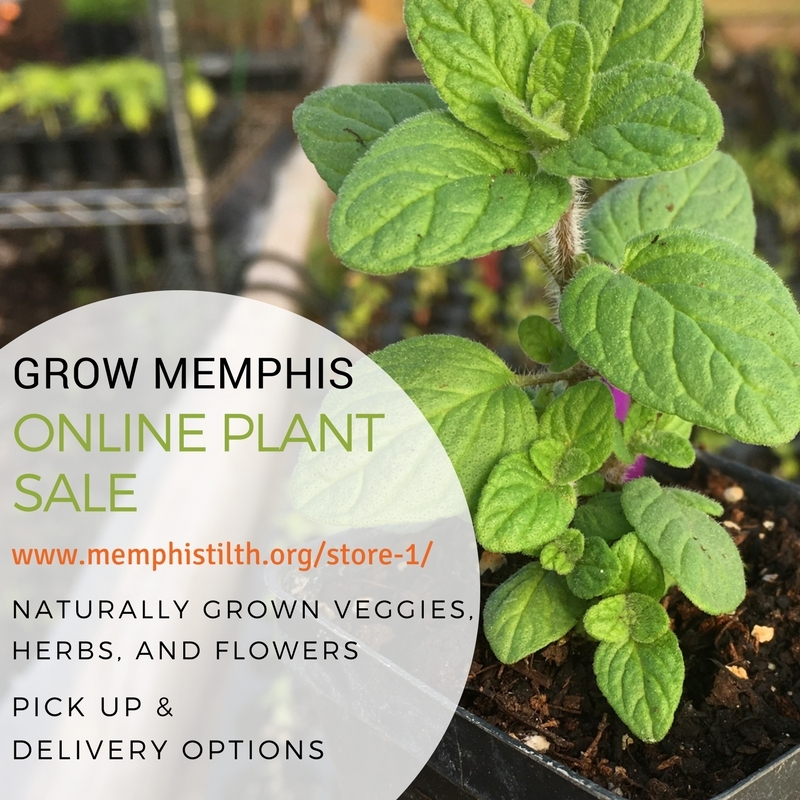 PLACE YOUR ORDER BY MAY 4TH, AND PICK UP ON FRIDAY MAY 11TH BETWEEN 12PM-4PM AT MEMPHIS TILTH, 575 SUZETTE ST SUITE C, MEMPHIS, TN 38126. BRING IT FOOD HUB SUBSCRIBERS WILL RECEIVE FLOWERS DELIVERED WITH THEIR SHARE. Learn gardening basics, how to grow your own food, and cook it at home! Cooking demo will be incorporated into workshop. Learn gardening basics, how to grow your own food, and cook it at home!